I don't know about you, but I can only eat so many Thanksgiving leftovers in the form of a cold sandwich. Yes, it's good. But not everyday for a week, right? Heat 2 T butter in a large skillet over medium heat. Add mushrooms and green onions and saute 8-10 minutes or until soft. Transfer to a small bowl. Melt 2 more tablespoons butter in skillet and add flour, stirring until smooth about 1 minute. Add chicken broth and half-and-half. Cook, stirring occasionally, 6 to 8 minutes or thickened and smooth. Remove from heat; stir in 1/4 C parmesan and next 3 ingredients. Fold in mushroom mixture, cooked pasta and turkey. Return to medium heat, and cook until thoroughly heated. Transfer to a lightly greased 2 qt. baking dish. Melt remaining tablespoon of butter, mix in breadcrumbs and remaining 1 tablespoon parmesan. Sprinkle topping evenly over dish. Place on middle rack and bake 25 to 30 minutes or until bubbling and beginning to brown. 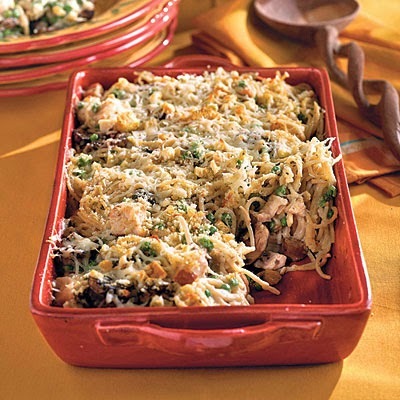 **You can certainly substitute leftover or rotisserie chicken if you want to make this other times of the year. I do - it's a perfect dinner to bring a new mom after coming home with baby.